Is Oatmeal Bad for Triglycerides? Cholesterol count is one of the most commonly used metrics for determining your health. This is due in part to the fact that it's an easily understood number. It's also partly due to the direct correlation between high levels of bad cholesterol and risk for circulatory disorders. Your best method for improving your cholesterol levels is to understand how your diet interacts with your blood serum cholesterol--for example, how coconut milk affects it. Coconut milk comes from the fluids that naturally occur in a coconut. 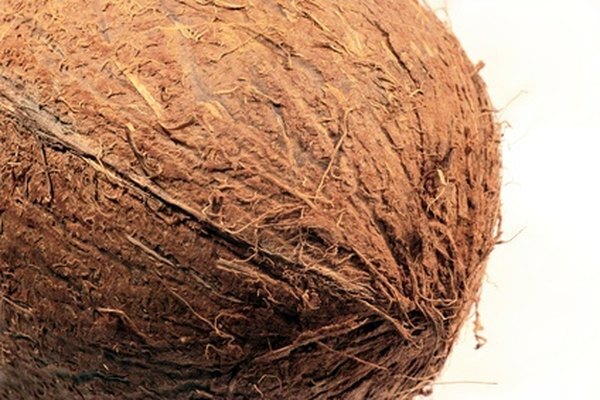 The inside of a fresh coconut is full of coconut water, which manufacturers mix with a pulp of the coconut meat--the white flesh inside the husk. Straining this mixture produces the thick, white coconut milk you can drink on its own or use in recipes. Nutrition science identifies three kinds of cholesterol that affect human health. LDL, or low-density lipoprotein, cholesterol and triglycerides are bad for your circulatory health. They tend to clump together in your blood stream, restricting blood flow and increasing your chances of heart disease, high blood pressure and other circulatory problems. HDL, or high-density lipoprotein, cholesterol cleans your bloodstream of harmful substances – including LDL and triglycerides – meaning it's actually good for your circulatory health. Your levels of all three kinds of cholesterol change according to what you eat. Diets rich in saturated fats increase your levels of harmful LDL cholesterol. Eating unsaturated fats, including monounsaturated and polyunsaturated options, increases your level of HDL cholesterol. Your body produces triglycerides in response to eating foods high in sugars and refined carbohydrates. Dietary fiber also affects your cholesterol level by contributing to the processes that help clean your circulatory system. The U.S. Department of Agriculture provides nutrition information for thousands of kinds of food, including coconut milk. According to the USDA, a 1-cup serving of coconut milk contains about 50 grams of saturated fat – more than 2 1/2 times the daily recommended allowance. It also contains about 3 grams of unsaturated fats, and one-fifth of the recommended allowance of dietary fiber. Taken together, this makes coconut milk a bad choice from a cholesterol standpoint. It may be all right for an occasional treat, but is not the best choice for daily consumption, and may be dangerous to those already struggling with high cholesterol.